Diva Devotee: New music: Listen to Tony Bennet feat Mariah Carey on "When Do The Bells Ring For Me" and Amy Winehouse on "Body and Soul". New music: Listen to Tony Bennet feat Mariah Carey on "When Do The Bells Ring For Me" and Amy Winehouse on "Body and Soul". 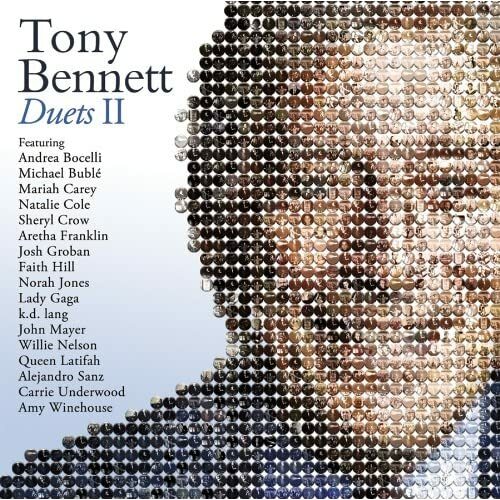 Mariah Carey and Amy Whinehouse were the two duets featured on Tony Bennett's upcoming Duets II album that I was most looking forward to hearing. Well it's lucky for me, and my impatience, then that those two songs leaked onto the internet before the albums 20th of September release date. I need a a little while, and a lot more listens, to really conjure up an opinion, but just thought I'd share the songs with you lovely readers! Below are my initial, sketchy impressions of the two songs. Listening to Amy Winehouse on Body and Soul just reminds me what a brilliant vocalist she was. Her skill at interpreting a melody and putting her own spin on it was truly something special. I particularly liked the way her voice would duck and dive around Tony's: sometimes dancing above it, but at other times grounding and fortifying it as it ventured into alto lows! Mariah Carey's feature on When Do The Bells Ring For Me, sounds kind of odd to me on first listen, because there are times when it doesn't even sound like her. Much of the song is sung in her "Whisper" register, which is warmer and slightly fuller than before. Mariah does crank up the voice and get up into the chest register by the end, but it comes off sounding slightly like shouting when it forgoes the vibrato, much in the same way as it sounded on the Memoirs of an Imperfect Geisha album. Still really excited to hear new Mariah though! Oh and Tony Bennet has a set of pipes on him! Can not believe he is in his 80s. His tone is incredible as is his rhythm!! Just thought I should mention him, considering the songs are from his album...lol.. I'm a huge Amy Winehouse fan, but like you I need a few more listens to decide if I really like the song, it was kind of forgettable to me on the first listen. I'm not a Mariah fan, but the only thing that really stuck out to me about the second song was how it doesn't really sound like her...maybe I'll just have to listen again but like the first song, it didn't really leave a lasting impression. find her to have a great range! I'd appreciate it! @4d785679ed4fc90843aeb2605cba3afc : I'm really looking forward to the other duets too, but those two were the ones I was most itching to hear! As for Sheryl Crow, I'll look into her profile! Love her stuff. @9a4eee81852add92cebf54af32f78132 I'm tending to agree with you about them being slightly forgetable at the moment. I think I'm going to wait for the whole album till i listen to them anymore. This sounds like the sort of music that you need to listen to with the volume up and a nice glass of red wine! I think it's difficult to appreciate both tracks out of context, so looking forward to hearing the whole album. Amy Winehouse complements Tony's voice well - but then I think this is a style she had always sung. Mariah sounds odd, but I suspect part of it is the fact that the production will have been geared towards Tony's voice and not her's. Might have to get me some wine! I agree Tony and Amy work better together. Definitely reserving full judgement till the whole album is released. saw that on youtube a few days ago. There's also an accompanying video where she talks about the whole process-http://www.youtube.com/watch?v=F9BZLTuYMXI. Also read that Tony is keen not to push the people he duets with in a particular sonic direction. He liked, and encouraged, the idea that the other singers brought their own style with them to the duets. Love Mariah part!!! And for the people who say it doesn't sound like her, you're crazy!!! Listen some of the songs from the Butterfly album, such as Prince's Beautiful one's.